PL18 is a small pipe transmitter sonde which is an efficient accessory for the Vesala CL43 Compact Locator and other Vesala cable tracers using the 512kHz (PL18-05) or 33kHz (PL18-33) tracing frequency. PL18 is a small pipe transmitter sonde which is an efficient accessory for the Vesala CL43 Compact Locator and other Vesala cable tracers using the 10kHz (PL18-10) or 33kHz (PL18-33) tracing frequency. PL18 powers on when the battery compartment is turned to the transmitter section. Sonde is attached to the push rod (snake) with the M12 threaded sleeve of the battery compartment or with tape. After that the sonde is pushed into the target pipe using the push rod. To avoid loosing signal e.g. at corners the sonde is traced with a cable tracer receiver along as it moves ahead. If sonde hits an obstacle or blockage, it´s possible to define the location and depth very accurately, which reduces unnecessary digging. PL18 has a red power-on LED at the side of the sonde. LED goes off if battery is weak. PL18 diameter is 18.2mm and length with standard battery compartment 85mm. 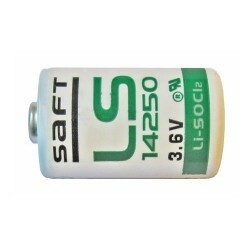 LS14250 is a 3.6V Lithium battery suitable for the PL18-05, PL18-10 and PL18-33 duct transmitter sondes. Battery capacity is typically 1200mAh but it may vary depending on the manufacturer. Battery maximum size is approx. 14.6 x 25.2mm. Battery is sold by piece. 2. Patareipesa M2 keerega, 1 tk. 4. Kasutusjuhend Inglise, Soome, Rootsi või Vene keeles, 1 tk.